Today was a very sad day. 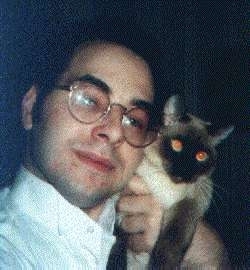 I had to put Puppycat, my 19 year old Siamese, to sleep. We came home last night to find her in front of her water bowl unable to move and soaked in her own urine. It was sad to see her suffer and not how I want to remember her. 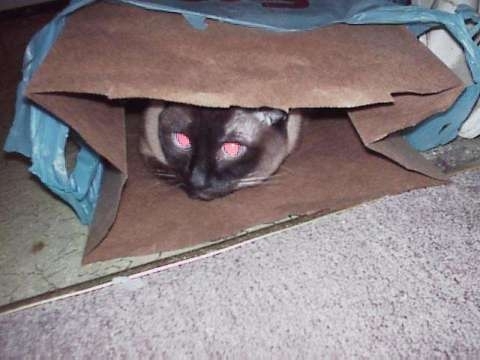 My friend Barbara told me her landlord said she couldn’t keep her Siamese kitten Tasha. Even though she was just a kitten Barbara was already her second owner. The original owner was very wealthy and paid $1,000 for her and had her 4 paw de-clawed (which I know is cruel and they missed a single claw) and then decided she didn’t want her anymore and gave her to Barbara. I had played with Tasha a bunch of times and I always thought she was cute. When Barbara told me she needed to find a home for her I asked my girlfriend Suzanne if she knew a good home and Suzanne suggested that I take her (which it turns out was what Barbara wanted as Tasha was only ever nice to me). I never meant to ‘rename’ Tasaha but I started to call her Puppycat and it stuck. She was a very unusual cat. She never cleaned herself, she never covered her litter, she would burn her whiskers in candles. 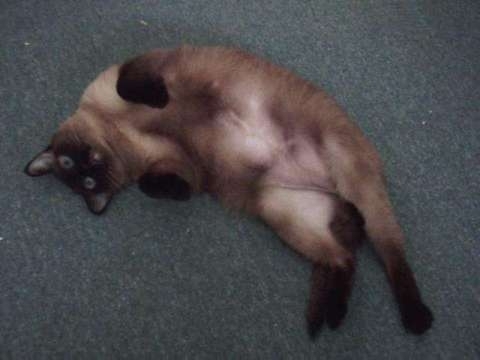 The vet said that she had instinct problems because she was taken away from her mother to early and was mildly retarded. 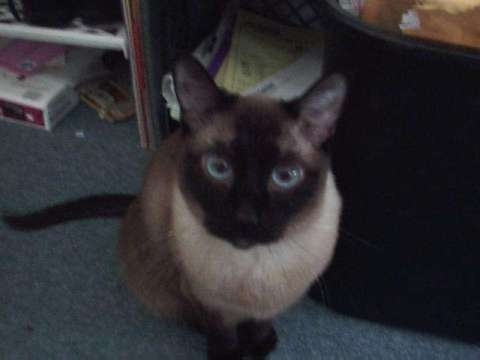 That aside she was loving and clever – sure she ran away from the litter box every times she pooped but she came when called and was always there when I needed her. She also knew she had that single claw. She would come at you with it if she needed to. When she first went into heat she was crazy and when I took to get her fixed they agreed to remove the last claw. The vet was very nice and told me that the first vet was a butcher and he removed bone fragments from all four paws. It left with her one flabby paw – she would nurse that paw and hated anyone touching it. After that though she became a biter – she would warn before she bit – and she would bite very deep – it was the only way she knew how to express herself. 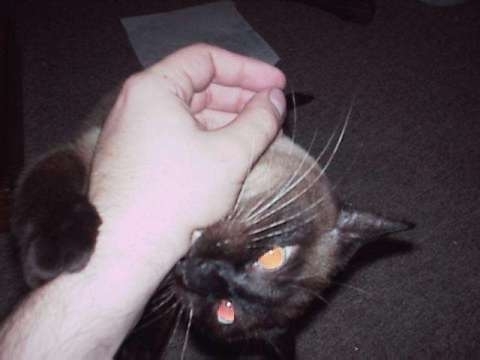 She never really bit me – but then again – I was the only one she every really liked. 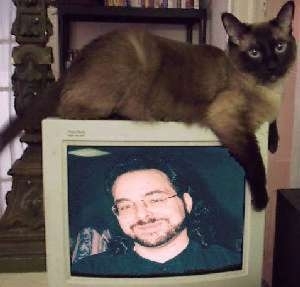 For 19 years she was my loving companion. She would often play with other cats and she came to tolerate the dog (who really wanted to be her friend) but I think Junior is going to miss her most of all. When we got Junior (my Manx) as a kitten, Puppycat really changed and her maternal instincts kicked in. Puppycat started to groom Junior (though still not herself) and the two wrestled and cuddled every night. We all have stories about our pets. I could tell the story about the time I took her to the mall in a bag, the time she tore open a friend of mine’s bag and ate all his pot, the time she knocked over my friends 5 year old little boy and stole his pizza, or that she would play with a ball of yarn so fiercely that she would tie the chairs to the table. Her last few years have been quiet ones. She spent most of her time sleeping on the ottoman and playing with Junior. I had hoped she would die in her sleep and putting her down was one of the hardest things I have ever had to do.